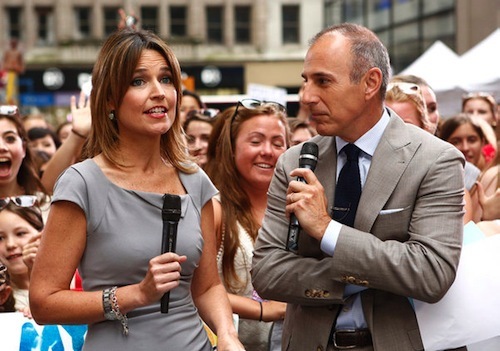 NBC made a quick date with Savannah Guthrie Friday, officially announcing her as the new co-host of Today after predecessor Ann Curry sobbed her way out of the picture during Thursday's edition. Guthrie, whose first official day is Monday, July 9th, has co-hosted the third hour of Today since June of last year. She also retains the title of NBC News' chief legal correspondent after earlier serving as the network's featured White House reporter from December 2008 until June 2011. She was widely reported to be Curry's successor, although Hoda Kotb (co-host of Today's fourth hour) and Today news anchor Natalie Morales also had been mentioned as possibilities. Meredith Vieira, who preceded Curry, turned down an offer to return, according to some news reports. NBC News president Steve Capus termed Guthrie "the ultimate team player" in a publicity release. "She's got an undeniable range, and she's earned the trust of the news community, her colleagues and our viewers alike." Today executive producer Jim Bell likewise gushed about Guthrie, citing her "one-of-a-kind combination of sharp wit and approachability. And our viewers value her journalistic skills and legal background just as much as her humor and charm. She can effortlessly go from interviewing the Secretary of State to jumping Olympic-sized hurdles on the Plaza." Guthrie will be called upon to do much more of the latter on an increasingly fun n' games Today, currently locked in a tight battle for network morning show supremacy with ABC's Good Morning America. Under such circumstances, winningly pan-frying a trout with a guest chef in reality is more important than interviewing public officials of import. In typical fashion, Curry went unmentioned in the announcement of Guthrie's promotion. Virtually all networks and local TV stations act in this fashion. Here today, gone tomorrow, with Curry already barely an afterthought even though she'll still ostensibly be a featured reporter on Today. ***FX says that Thursday night's premiere of Charlie Sheen's Anger Management sitcom ranked as the "most-watched scripted comedy series premiere in cable history -- excluding children's programming." According to the national Nielsen ratings, Episode 1 of Anger Management had 5.47 million viewers before Episode 2 inched up to 5.74 million. Anger Management also averaged 2.65 million and 2.89 million viewers in the advertiser-prized 18-to-49-year-old demographic. FX says that's also a comedy series record in the cable firmament. FX offered less detail on the ratings performances of the following Wilfred and Louie, but said that their new season premieres respectively were up 71% and 55% over their previous seasons' audience averages. The network's closing act, Brand X with Russell Brand, "got off to a good start" with its debut episode, FX said. It drew 1.1 million viewers, with 687,000 in the 18-to-49 range. ***TNT has renewed its resident power hitter, Rizzoli & Isles, for a fourth season. The crime drama, co-starring Dallas native Angie Harmon, has been averaging a robust 7.1 million viewers this summer in its new Tuesday night slot. Season 4 will have 15 episodes, TNT announced Friday. Over at sister network TBS, the first-year comedy Men At Work has been green-lighted for a sophomore season. Its Season 1 finale will be on July 12th. ***Finally, TNT has scheduled a Fourth of July Dallas marathon, with the four previously shown episodes airing in sequence from 4 to 8 p.m. (central) before a new hour at 8 p.m.